Special Note Regarding OPEN PLAY: It is always recommend to call in advance and reserve your courts to ensure open play time, however you may stop in and hope for the best. League make-up games, private parties and other events may be scheduled, so please call for availability. Details on our leagues may be found below. Anytime the courts are not in use they are available for open play with two hour time limit on use. If you want to ensure your time, you may reserve a court. Players are all required to sign a waiver prior to play. Call 614-792-8393 for more information on sand volleyball or to reserve your court! 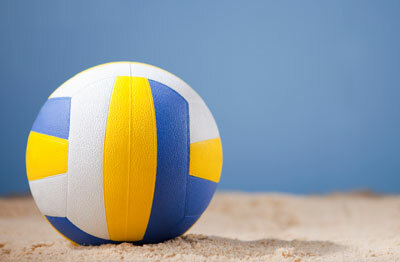 We offer sand volleyball leagues six nights a week; Sunday - Friday. Sand volleyball leagues are all about co-ed recreational fun. All skill levels are welcome and teams are co-ed 6's. Tuesday and Thursday are competitive leagues with referees. Some nights fill up faster than others so be sure to get your team registered early to secure your spot! You may download the registration packet here. If you wish to register now, you may stop in and pay in person or email events@lazychameleon.com. You may also register via capitalcitysports.com. Below is the schedule for 2018. Early Sign up fee is $175. (DEADLINE IS March 15th) Competitive League $265 - Early Sign up $245. *Tuesday and Thursday leagues are competitive and referees are included in the fee. Fee is $225.00. Tournaments are 6 teams with best 2 out of 3. CLICK HERE FOR LAZY CHAMELEON SAND VOLLEYBALL RULES. CLICK HERE TO PRINT LAZY CHAMELEON WAIVER AND DISCLAIMER. © Copyright 2019 The Lazy Chameleon. All Rights Reserved.